You’re invited to our charity cycling/spin class! Do something healthy for yourself while helping to provide nutritious food for people living with chronic illnesses. It doesn’t matter if you’re an experienced cyclist, a spinning fanatic, or you’ve never taken a spin class before…this is a great way to try it out! This event is generously sponsored by Orange Bank & Trust Company. 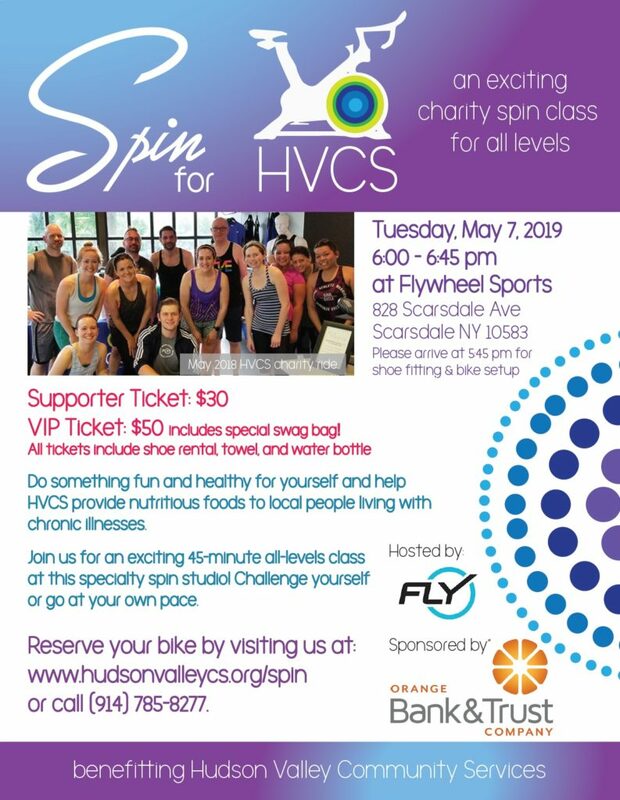 Join us at Flywheel Sports in Scarsdale on Tuesday, May 7, 2019 at 6:00 pm for an instructor-led spin class. There are only 46 spots in the spin stadium so book your bike now! Flywheel will provide the special shoe rental (the shoes anchor you to the bike pedals) and use of towels, and we’ll provide water bottles. Upgrade to a VIP ticket and get a special swag bag! You can arrive early to handle the shoe rental and warm up. Flywheel advises that you don’t eat a big meal before taking the class, but we’ll adjourn to a nearby restaurant for post-workout snacks (not included in the ticket price). The majority of your ticket will go to our Westchester office’s emergency food closet, which helps low-income people living with chronic illnesses maintain a healthy, nutritious supply of food so they can maximize their quality of life. Flywheel is located at 828 Scarsdale Avenue, Scarsdale NY 10583. Check out their website here.